With so many Sachen Game Boy variants floating around the world, I believe that it might be of some use for the collector if these releases were examined more closely. Just today, I discovered that I even ended up owning basically two sets of what turned out to be the same product, and thus I hope to shed some light on the variants and releases floating around out there, so that people can make a better decision as to which Sachen Game Boy carts they want to collect. Sachen, aka Thin Chen Enterprises, seemingly became involved in the development of software for handheld gaming devices during the early 1990s, possibly in 1992. Thin Chen initially ported several of its Famicom games to the Watara Supervision, an obscure handheld machine, which, at the time, had been hyped up to be a major competitor to Nintendo’s highly-popular Game Boy. In addition to the ports from its Famicom library, Thin Chen would also design a few new titles, which would be released on the Supervision. By 1993, Sachen would branch out and develop games for several other portable gaming machines, including the Mega Duck and its equally obscure cousin, the Cougar Boy. It was during this time that Sachen would also begin developing games for the Game Boy, which were advertised under Sachen’s alias, Commin. The above-mentioned 36 games were released on 4 in 1 multicarts for the black and white Game Boy machine, and were released in boxes such as the ones seen below. These cartridges were exported across the globe, and each pack included an English manual, as well as a localized manual in a variety of languages, such as German and Portuguese. 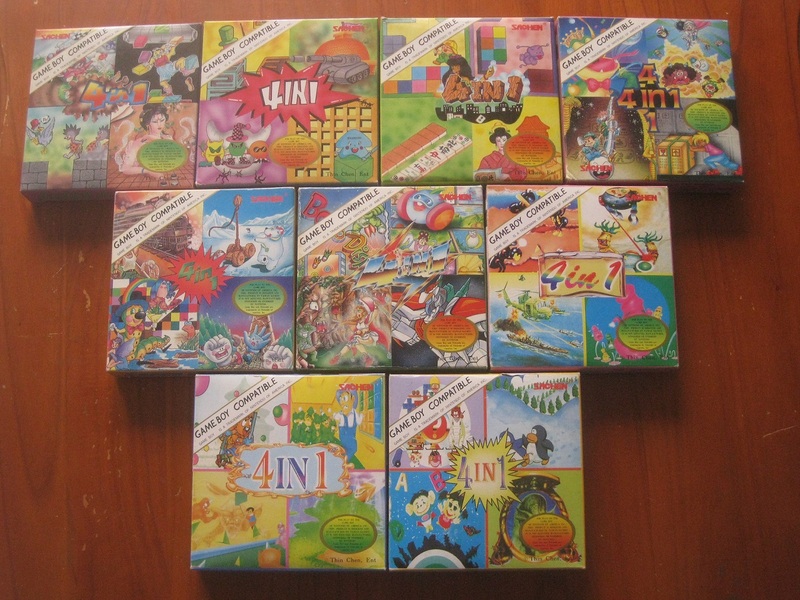 Some of the 4 in 1 game packs were also published in Germany and distributed there by Nic Nac Electronic-Land. These cartridges are housed within special cardboard boxes, containing German text. They look nothing like the boxes shown below. Tucked away inside one of the above 4 in 1 boxes was a flier from Commin Games, which advertised some of their game releases. To quote to advert, “Searching for cool Game Boy – compatible games? Here you are!” The flier then goes on to displaying twenty different single-cart Game Boy releases, each with a part number B—. At first blush, one might believe that this flier was really advertising the Mega Duck / Cougar Boy games, since the titles listed were only released on the Game Boy in the four packs discussed above. On the other hand, the part numbers do not properly match with the Mega Duck / Cougar Boy releases, and the flier also specifically mentions Game Boy in its opening line. Does this mean that there are about twenty different single cartridge Sachen games for Game Boy, which are so obscure that no one has yet to find them? While I would love if this were indeed the case, findings thus far have shown other evidence that these carts actually exist. Hmm. The most interesting cart shown on that flier is Beast Fighter. 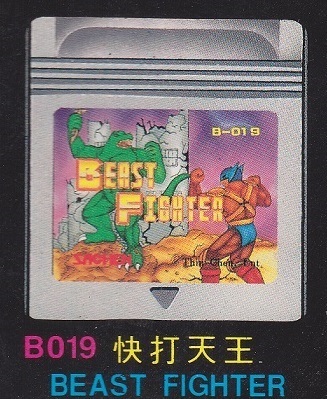 Beast Fighter would not be released during this time, and would only eventually be released on the Game Boy, seven years later (in the year 2000). During the first few years in the 21st century, Sachen was still around, cranking out new game products. During this time they released several new Game Boy games, including Beast Fighter, Street Hero, Thunder Blast Man (aka Rocman X), Jurassic Boy 2, and 2002 Gedou Zhanlue, which would be their final game release. These games would be released for the Game Boy Color, though most of them are backwards compatible with the Game Boy. From the pictures below, one can easily identify the local and international versions of the game. The copies sent abroad were packaged in the larger, square boxes, whereas the Taiwanese cartridges were housed in the smaller, petite boxes. Interestingly enough, while some of the boxes indicate that they contain multilingual instruction manuals, they don’t. The international versions contain English as a lingua franca, and then they also have various localized manuals inside as well. Another large difference between the international and Taiwanese boxes is that the international versions are larger, thus allowing more artwork to be displayed. Although this is the case, I had my first contact with the Taiwanese versions, and thus prefer the look of those boxes. Now let’s say a few words about the three games displayed in the above picture. Whereas there is little of interest to discuss concerning Street Hero (it was released in both an international and Taiwanese version), the other two games – 2002 Gedou Zhanlue and Rocman X – have several things worth noting. 2002 Gedou Zhanlue would be the last game published by Sachen. Unlike their other Game Boy releases, this title never saw the light of day outside of Taiwan (and possibly other Chinese-speaking pockets around the globe). The game itself is text intensive, and is of little enjoyment to anyone who cannot understand Chinese. 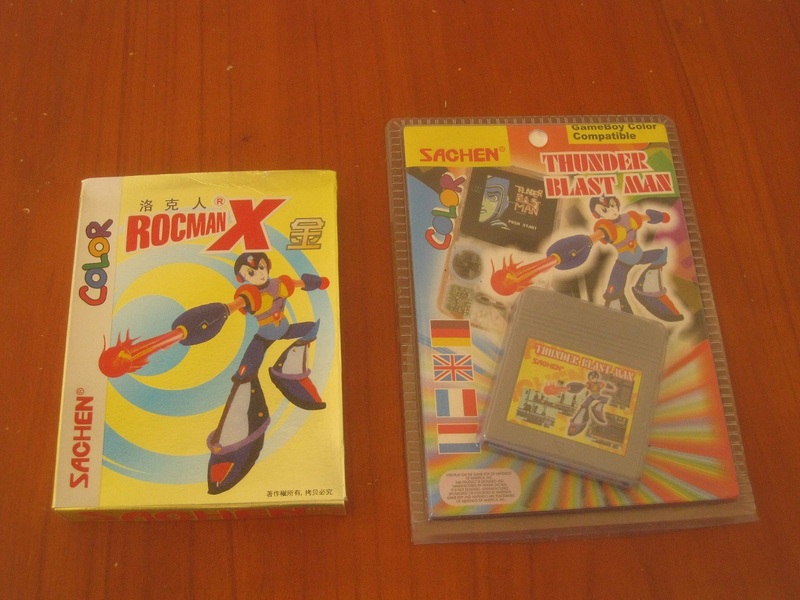 That brings us to one of Sachen’s rarest releases for the Game Boy: Rocman X / Thunder Blast Man. 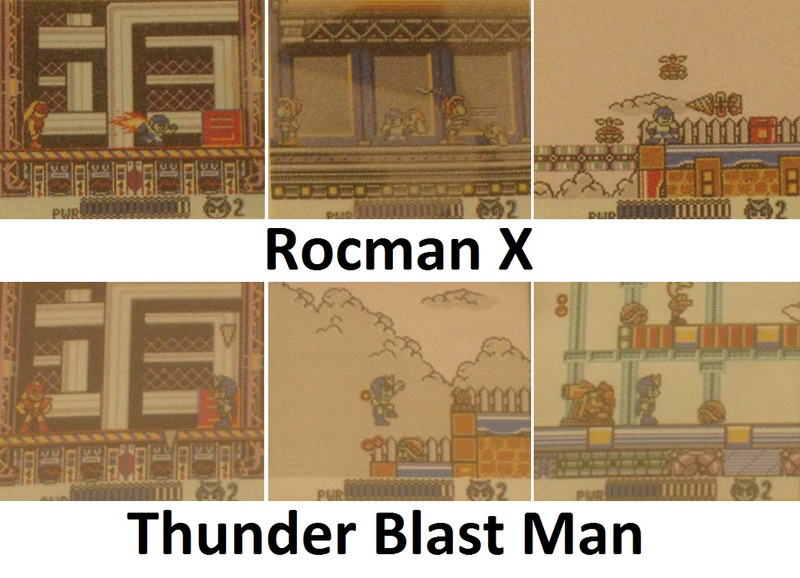 Thunder Blast Man and Rocman X can be considered the same game. 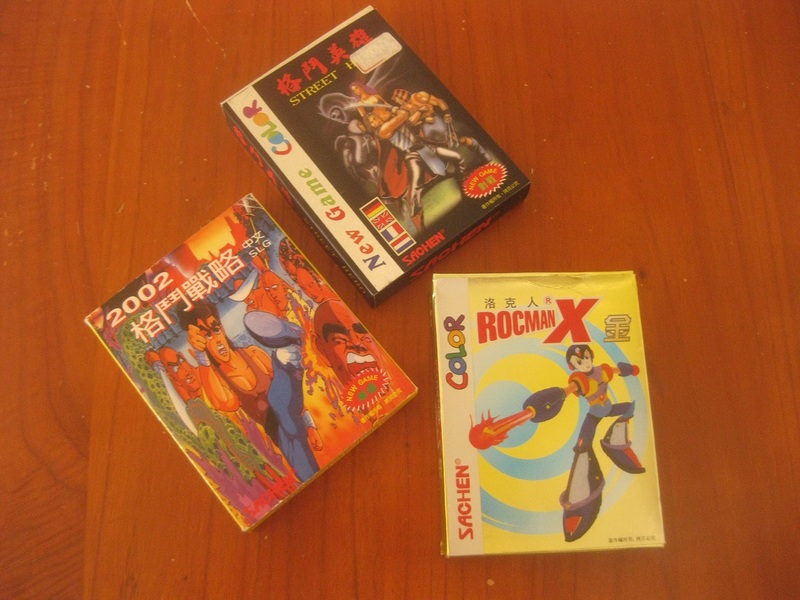 It seems as though the Rocman X version was released for the Chinese-speaking market, whereas the Thunder Blast Man version would be released abroad, sometimes showing up for auction in Europe. Either way, aside from a different title screen and changed character sprites, the two games are virtually identical. 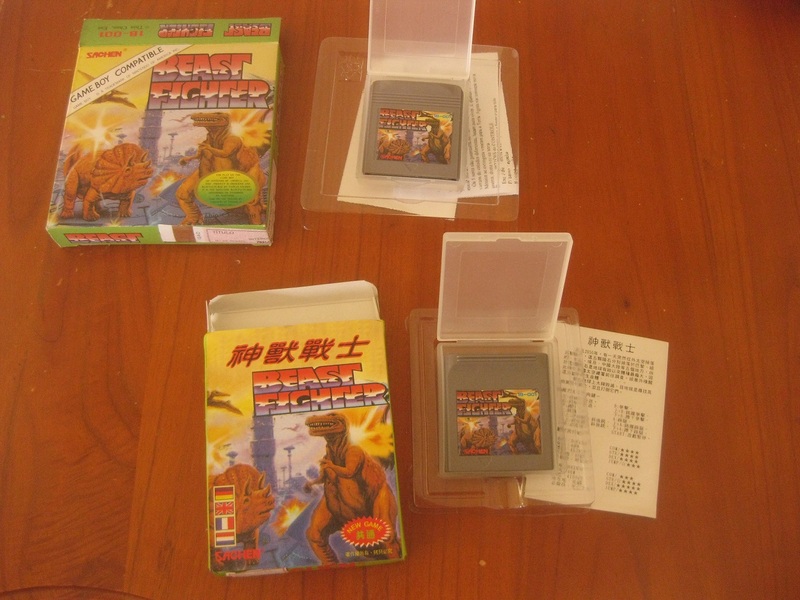 Hands down, these are two of the rarest Sachen Game Boy games known to exist, and due to being released exclusively in a blister pack, it is almost impossible to find a “complete” copy of Thunder Blast Man for sale. During Sachen’s reappearance in game development, they would recode their original black and white Game Boy multicart packs, and recode them so that they would be compatible with the Game Boy Color. 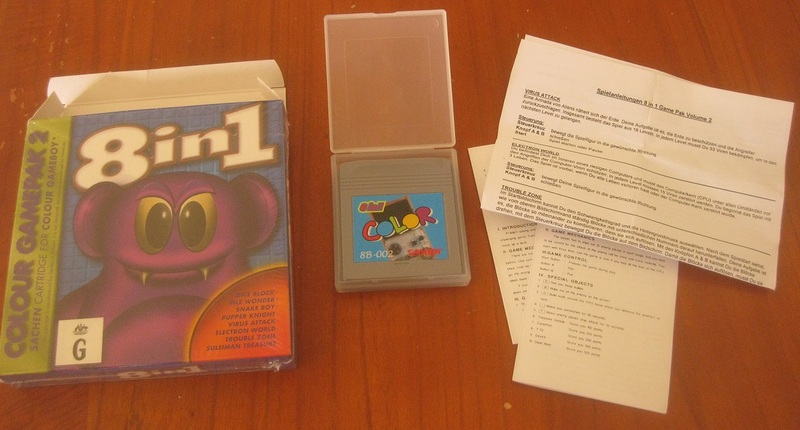 These Game Boy Color 4 in 1 packs are the same as the black and white versions, only the menus have been cleaned up a bit, and of course the games now can be enjoyed on a GBC. 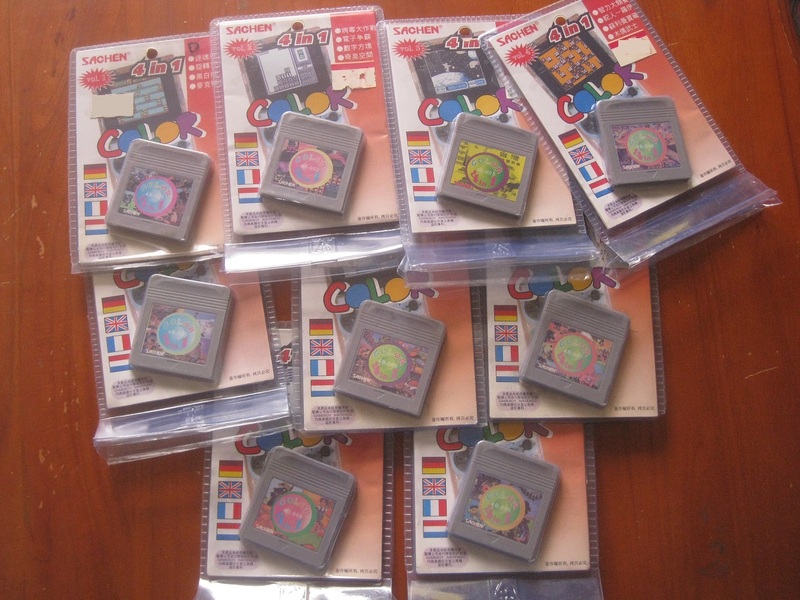 The Taiwanese versions were released in blister packs, and so were some of the various international versions, sent across the globe. Besides these 4 in 1 multicarts, Sachen would also try to squeeze even more money out of their cash cow by releasing a variety of other Game Boy Color multicarts, which all contain the same material as can be found on the originals. 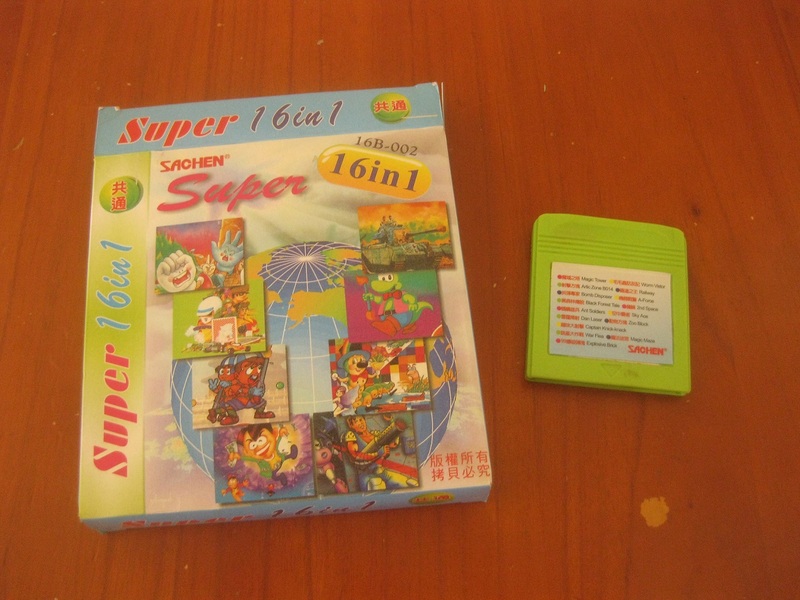 For example, Sachen teamed up with Home Entertainment Suppliers, and released four different 8 in 1 game packs for the Game Boy, which each combine the games from two of the four in one packs. Some of these carts eventually made it for sale in Germany, with German manuals. 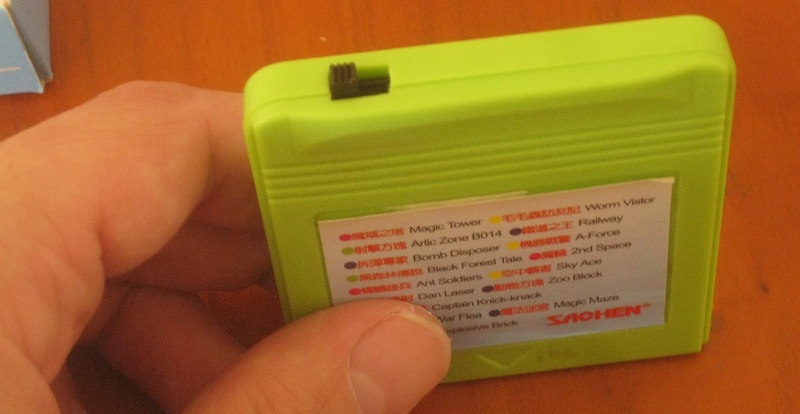 Of the Sachen Game Boy releases, these carts are my least favorite, as they don’t bring anything new to the table, and the packages are also just so damn ugly. Then we have two 16 in 1 game cartridges. When I compared the game lists to the contents of the above carts, I came to realize that the first cartridge (16B-001) is just a combination of the above 8B-001 and 8B-002 carts, whereas the 16B-002 cartridge contains the games from 8B-003 and 8B-004. These game compilations were released in Taiwan, for sure, and it is unknown whether they made it elsewhere across the globe. One of the fun things about these two cartridges is that they use a dipswitch located on the top of the cartridge to switch between the two menus, which each contain 8 different games. This is a throwback to the old Famicom multicarts made by Bit Corp, which used dipswitches to switch between the various titles housed on the cartridge. So for a quirkiness factor, these carts take the cake! The largest Game Boy multicart that Sachen would develop was the 31-in-1 Mighty Mix. This cartridge was another cart developed for release in Australia by HES. 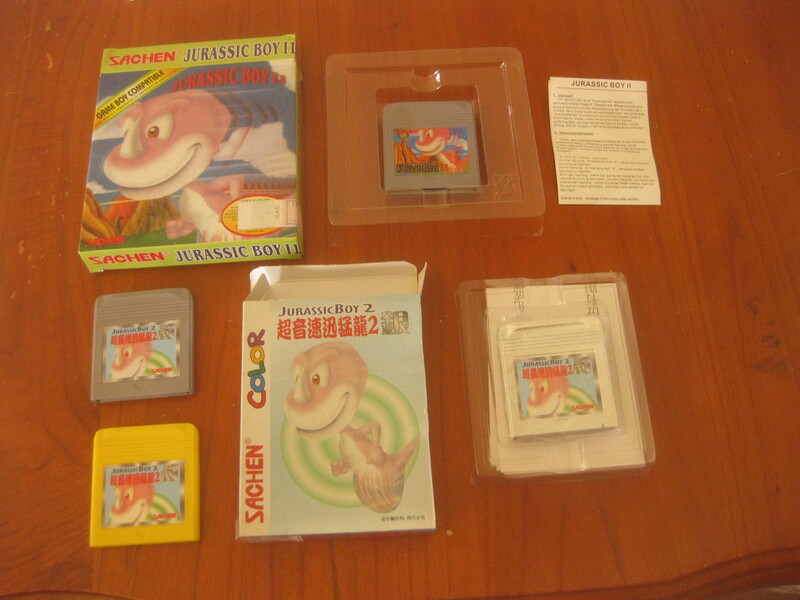 The cart contains Thunder Blast Man, Jurassic Boy 2, and most of the games from Sachen’s black and white catalogue. Luckily, this game’s packaging is a lot nicer looking than the others published by HES. *I would personally include Thunder Blast Man on the list, as it is basically a similar situation as Stadium Events and World Class Track Meet are on the NES. While the two games are very similar, different packages, title screens, sprites, etc. would make me include both of the games on a complete list of Sachen games. Those blister packages have European Flags.That 8 in 1 has an Australian Age rating. That’s some international reach! I got today a copy of Sachen’s Thunder Blast Man for GB – Color version. I did not find it on ebay, to know how much the price for that game is! It’s only the cartridge, but works fine. Some idea what it could cost? Is it box or loose? Loose, I would say $50 on a good day. Boxed, a bit more.